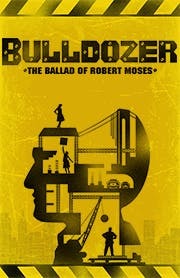 BULLDOZER: THE BALLAD OF ROBERT MOSES a rock musical about the man who built and broke New York. As Robert Moses pushes his way through the city of New York, building parkways and bridges to make the city move no matter the cost, his grand vision meets the reality of remaking the city. Seemingly impervious, Robert Moses bulldozes without consequence on the road to complete his vision for the city. Staring CONSTANTINE MAROULIS, RYAN KNOWLES, MOLLY POPE, KACIE SHEIK and WAYNE WILCOX.